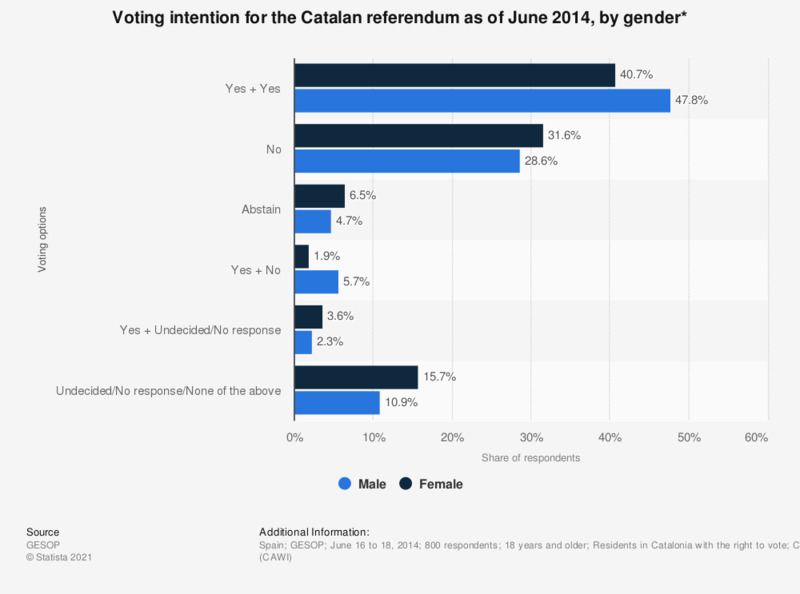 This statistic shows voting intentions for the Catalan referendum on independence planned to take place on November 9, according to a survey carried out in June 2014, by gender. Male voters were significantly more likely to vote in favor of Catalonia becoming a state whether or not they believed this state should be independent. 31.6 percent of women were against Catalonia becoming a state compared to 28.6 percent of men. * The Catalan referendum will have two questions: 1. Do you want Catalonia to become a state? 2. Do you want this state to be independent? A 'Yes + Yes' vote is in favor of Catalonia becoming an independent state, a 'Yes + No' vote is in favor of Catalonia becoming a state, but not independent from Spain. Surveys of respodents up to 44 years were carried out via computer-assisted web interviews. Those aged 45 or over were surveyed through computer-assisted telephone interviews. Do you think that the Catalan referendum is an internal affair of Spain or an EU issue?